Why are there so many grain-free puppy foods? Is it a new trend that is following the gluten-free human diets or are these products actually healthier for your puppy? In this post we’ll take a look at the best grain-free puppy foods, the benefits of grain-free, and the misconceptions. The most important thing to keep in mind is that whatever food you choose for your puppy, it offers complete and balanced nutrition. This is true for all foods, with or without grains. Whole grains can provide essential nutrients, such as linoleic acid and vitamin E so if you choose grain-free, make sure that these nutrients are provided by other ingredients. Now let’s talk about the benefits of grain-free. Often these products include higher amounts of proteins and animal fats with fewer carbohydrates. This makes the food more easily digested. But isn’t always the case, so make sure to read the label. And puppies still need small portions of carbohydrates to remain at peak health and growth. Grain-free means less stool as more of the ingested food is being used so less waste is produced. It also keeps puppies fuller for longer with a greater caloric density, meaning your puppy will need less food than other foods with grains. This means higher energy levels, so grain-free can be a great choice for active breeds. Another benefit may be healthier skin and coat. 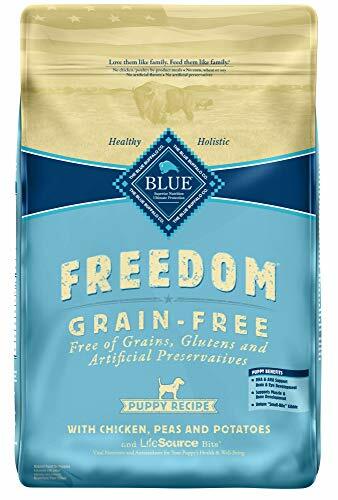 A common misconception about grain-free puppy food is that it means that it is carbohydrate-free as well. While it is true that many grain-free products have lower levels of carbohydrates, some have the same or higher when compared to products with grains. Also, very low levels of carbohydrates are not necessarily good for your growing puppy, although they can be beneficial for pets with diabetes. Carbohydrates contain many essential nutrients for healthy growth. Grain-free foods replace grain with starches like potatoes and peas. These ingredients often contain more carbohydrates than grains do. Another misconception is that grain is an unnatural source of nutrition. Our puppies’ ancestors didn’t eat grain as part of their diets so why would it be healthy for our puppies? However, one could argue that potatoes and peas are no more “natural” in that sense. And wild dogs do eat the stomach contents of their prey, which often included carbohydrates in the form of grains and other sources. So the bulk of their diets included proteins and fats, but they did consume smaller amounts of carbohydrates, fruits, vegetables, etc. Grains also get a bad reputation because, especially in the past, many dog food products contained fillers, which are ingredients that are cheap and add practically zero nutritional value. Examples of fillers include, but are not limited to, cereal food fines, brewers rice, soy flour, feeding oat meal, corn bran, hulls (rice, peanut), mill runs (wheat, soybean), and DDGS (distillers dried grains). These ingredients are over processed, difficult to digest, and can lead to damage of the lining of the digestive system. Damaging this lining can cause leaky gut, obesity, food sensitivities/allergies, and even bowel inflammation disorders. So it’s more important to avoid fillers than it is to go completely grain-free. Another great, healthy option is to go organic. We talk about the benefits in our post about organic puppy food. The last misconception is that puppies are often allergic to grains. We think this misunderstanding stems from the fact that many humans are sensitive to gluten. The reality is that puppies are much more likely to be allergic to protein sources. In fact, among the most common allergens are beef and dairy. That is not to say that no dogs are allergic to grain; some are. If your puppy is sensitive to grains, a grain-free formula is definitely the way to go. However, if your puppy has a sensitive stomach, the grains in her food may not be the culprit. Learn more by reading our article about puppy food for sensitive stomachs. Before we share our favorite grain-free puppy foods with you, let’s talk a little about puppy food in general. We go in depth in this post, but the basics are know your puppy and know what ingredients are in her food. Large breed puppies (>50lbs as an adult) have different nutritional needs because they grow differently. Please see this post﻿ about large breed puppy food if you want to know more. Next, make sure the ingredients you’re feeding your puppy are whole foods and avoid fillers, artificial colors, artificial preservatives, antibiotics, and pesticides. We’ve done our research and come up with 6 choices of excellent grain-free puppy foods. Your puppy will growth smart and strong with any of these products. (36% minimum Protein, 18% minimum Fat, 5% maximum Fiber, 3792 kcals/kg) The main ingredients include deboned chicken, chicken meal, turkey meal, potatoes, peas, potato protein, and chicken fat (preserved with mixed tocopherols). Wellness proudly makes their products in the USA with premium, all-natural ingredients. This recipe is protein-rich (mainly comprised of meat) with the calories and DHA necessary for healthy development of the body and mind of your puppy. They use chicken, turkey, salmon oil, fruits, and veggies to support optimum health in a smaller kibble size for your puppy’s small mouth. You’ll find no meat by-products, fillers, grains, or artificial colors, flavors, and preservatives. (28% minimum Protein, 17% minimum Fat, 5% maximum Fiber, 3656 kcals/kg) The main ingredients include buffalo, lamb meal, sweet potatoes, egg product, pea protein, peas, potatoes, and canola oil. Taste of the Wild provides digestible energy and excellent nutrition for your growing pup with this recipe. 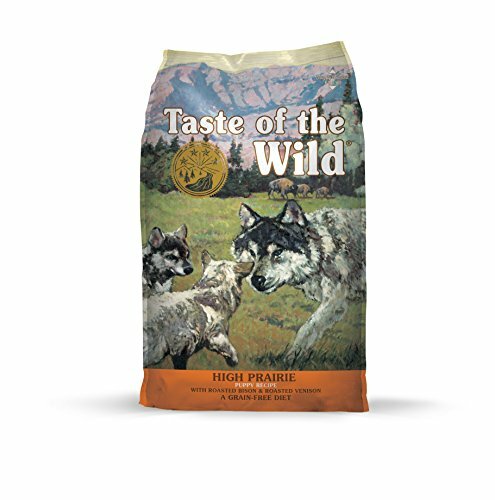 They use a blend of protein sources making this kibble extra tasty and protein-rich. Fruits and veggies are included to deliver natural antioxidants. They base their formula off of the diet your puppy would find in the wild; natural and nutritional. (27% minimum Protein, 16% minimum Fat, 5% maximum Fiber, 3701kcals/kg) The main ingredients include deboned chicken, chicken meal, tapioca starch, potatoes, peas, turkey meal, and chicken fat (preserved with mixed tocopherols). Blue made this formula especially for puppies that are sensitive to grains. They use the finest ingredients chosen by their animal nutritionists to provide the optimum ratios of protein, fats, and carbohydrates. You will find no artificial ingredients, but instead plenty of whole foods like deboned chicken, sweet potatoes, blueberries, and cranberries. Shaped into unique small-bite size, it’s perfect for small mouths and is great for promoting tartar removal. This recipe also has plenty of DHA, an important fatty acid that contributes to the development of retinal function and cognitive learning. Keep your puppy’s eyes and brain sharp! (33% minimum Protein, 15% minimum Fat, 5% maximum Fiber, 3685 kcals/kg) The main ingredients include chicken meal, peas, chickpeas, tapioca, chicken, chicken eggs, and chicken fat (preserved with mixed tocopherols and citric acid). Nature’s Variety uses natural ingredients with added vitamins and minerals with no artificial preservatives, colors, or flavors. This recipe is high-protein and grain-free with freeze-dried raw pieces providing a nutrient-rich diet. It is the perfect combination of convenience and nutrition. 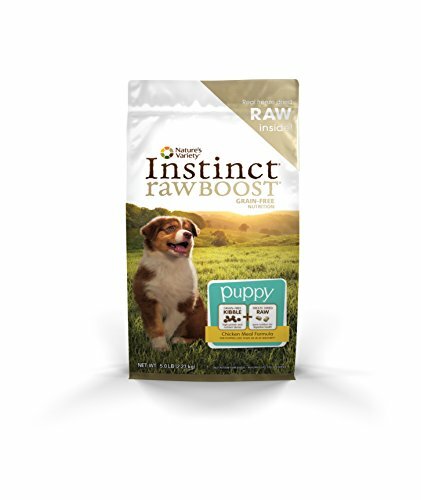 Your puppy will be bursting with energy and vitality. This formula will help your puppy maintain an ideal weight while growing lean, strong muscles. Nature’s Variety makes their products in US facilities providing a nutrient-rich diet to promote whole-body growth. (30% minimum Protein, 12% minimum Fat, 4% maximum Fiber, 3470 kcals/kg) The main ingredients include chicken, menhaden fish meal, lentils, peas, potatoes, dried whole egg, and chicken fat. 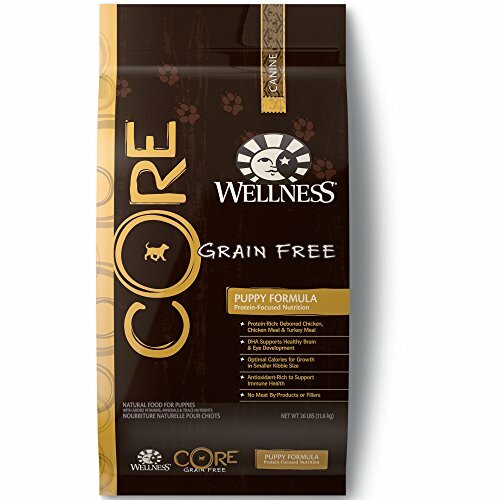 This is a grain-free, limited ingredient diet that is great for puppies with sensitivities. It is made with whole foods for gentle digestion. 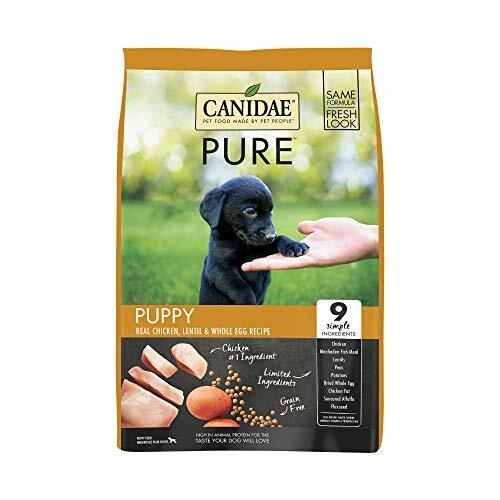 Canidae uses 9 key ingredients that are easily recognizable so you know what your puppy is getting. Your pup will love the great taste and the balance, complete nutrition of this recipe. They people at Canidae also really do care about the nutrition and care of your puppy. They have great customer service that will help you with your concerns, including meal planning. (38% minimum Protein, 20% minimum Fat, 6% maximum Fiber, 3960 kcals/kg) The main ingredients include deboned chicken, deboned turkey, yellowtail ﬂounder, whole eggs, whole atlantic mackerel, chicken liver, turkey liver, chicken heart, turkey heart, whole atlantic herring, dehydrated chicken, dehydrated turkey, dehydrated mackerel, dehydrated chicken liver, dehydrated turkey liver, whole green peas, whole navy beans, red lentils, chicken necks, chicken kidney, and chicken fat. 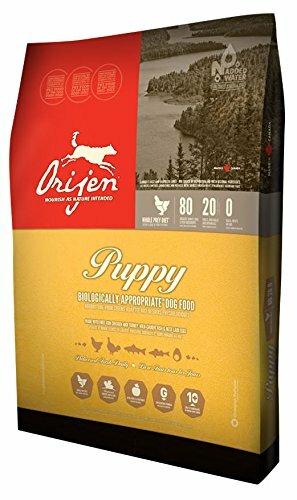 Orijen designed this formula to match your puppy’s natural diet. It contains a diverse balance of meats, fruits, and veggies to optimally support the growth of your puppy. Their chicken is free-run; their fish is wild-caught; and both are farmed or fished within their region and delivered fresh, never frozen, so you know your puppy is getting the best. Orijen uses limited carbohydrates (all grain-free) and regional, nutrient-rich fruits, veggies, and botanicals. This formula will keep your puppy healthy, happy, and strong while she grows into a beautiful, powerful dog. Thanks for reading our thoughts about the best grain-free puppy foods. Going grain-free can be a great choice for your puppy if they are very active, have sensitivities to grain, or just plain love the taste. Just be sure that your puppy is getting complete, balanced nutrition whether or not her food includes grains. And if you have any questions, please feel free to contact us. Here at ReadySetDogs, we are committed to helping you provide the best care for your growing pup.